Andrew Flete takes the ball up the court for the Broncos. 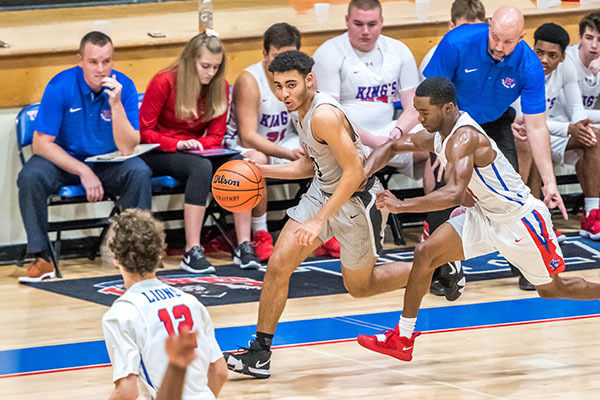 The Palm Beach Central High School boys basketball team weathered an early surge by the King’s Academy and cruised to a 63-43 victory on the road against the host Lions on Friday, Jan. 26. The Broncos (15-5) were led by Eduardo Diaz with 17 points and two three-point baskets. The Lions jumped out to an early 4-0 lead in the first two minutes of the game, but the Broncos quickly rallied back to grab a 13-10 lead, which forced a timeout by the Lions. The Broncos held the momentum for the balance of the first half, leading 37-18, in addition to holding the Lions to single-digit scoring in the second period. The King’s Academy established some early steam in the third period, outscoring the Broncos 15-7, but with Palm Beach Central holding such a lead, it made for a difficult quest for the Lions to climb close enough to challenge for the lead. The Broncos poured on the offense in the final period to pull away, despite a valiant effort by the Lions, and closed out the contest with a 20-point victory, 63-43. The win improved the Broncos to 15-5 after winning three games straight. Top performances on the night for the Broncos were Diaz with 17 points and two three-point baskets; Alphonse Alfred scored 12 points and recorded a three-point basket. The Broncos were also 18 for 22 from the free-throw line. Palm Beach Central is scheduled to travel across town to play rival and district foe Wellington High School on Friday, Feb. 1 in a much-anticipated rematch, after the Broncos bested Wellington in their first meeting of the season. Tip-off is at 7:30 p.m.